It is almost a year since the EWS Quarters slum was demolished and the residents ruthlessly thrown away from their homes. In spite of various protests and struggles against this inhuman slum demolition by slum dwellers, Dalit, Left, Student, Community based and other organisations for a year now, there hasn’t been a single response from the government on this issue. Even the new Congress government hasn’t responded to the five memorandums to the CM that the Forum against EWS Land Grab has submitted on this issue. The government in its callousness has not even bothered to hold talks on this issue and is steadfastly ignoring all protests and memorandums on this issue. Many of the evicted families are still living on footpath next to the EWS site. Many evicted families who had shifted to other slums are now back on the street as they are unable to cope with the rent, electricity, water and other expenses. The community feels that it is time to go in for a resolute struggle with full strength. Therefore, we are planning for a indefinite sit-in Dharna outside Town Hall, from Friday, Jan 17th, 11.30am onwards. We will continue till the government responds favourably to our demands and cancels the agreement with Maverick Holdings, thus returning the land to its rightful owners – the EWS of Bangalore. H.S.Doreswamy, Freedom fighter and Gandhian will join us for the beginning of the Dharna. This is a final and resolute strategic intervention to get back the EWS land. Please do cover the Dharna and help us achieve justice. Please do send your correspondent and photographer/camer-person for the same. This is published under Message Forward service by Citizen Matters, a space meant for non-profit public service messages from individuals and organisations. 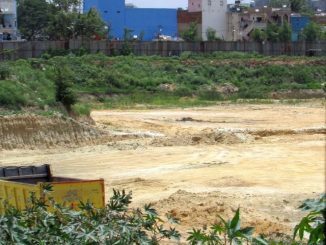 Why has the BBMP not given plan sanction to the entire Ejipura EWS quarters project? What are the issues with plan approval? A housing project on nearly 16 acres of BBMP-owned land for low-income residents in the Rajendranagar area of Ejipura-Koramangala has sparked off tensions amongst residents there, instead of bringing joy. Public-private partnership does not allow land transfer to developers, but the BBMP has promised a sale in the MoU signed, and the developer is banking on it. Where will this lead to?